I'm just starting off in electronics and am already fascinated. Having played with an Arduino these past few days I'm aware that binary is a representation of different voltages - such as +5V representing 1 and GND representing 0. I've been trying to discover how, at a physical level, the microcontroller converts the binary to these voltages. I cant seem to find a description anywhere. Can anyone share their knowledge or point me to a place/good book that describes how this works? There is no conversion from binary 1's and 0's to voltages like 5 V and 0 V. The microcontroller, or any physical circuit, just operates on the voltages. Those voltages are "converted" to binary 1's and 0's in our heads when we form a simplified model in our minds about how the circuit is working. There isn't really a "conversion" that takes place. Binary 1s and 0s is just a virtual representation of the underlying voltages. In fact, in many systems a high voltage might mean 0 while a low voltage means 1. There are some reasons why this is done, but probably more then you care to dive into this early on. To understand what is happening in the logic, it is probably best to look into the transistor. A transistor can be used for many things, but at a simple level you can treat it as a switch. Conceptually you can think of it just like your light switch on the wall, but instead of being controlled by physically moving the switch it is controlled by the change in current. You could treat the light being on as a 1 and the light off being a 0. Now you can start to combine these switches in varying sets to create different logic elements (like AND, OR, NOR, etc). I know my answer isn't horribly detailed, but I hope it will answer your question. If you need more explanation I will be willing to add more detail, just don't want to overwhelm you. The short answer is it doesn't "convert", the voltages are the binary (or a representation of it). Just like if you write a number on some paper the marks are a representation of the number, or count on an abacus the stone positions are a representation of a number. The sequence 10 in any base means the base to the first power, so in decimal 10 means 10^1 = 10, and in binary it means 2^1 = 2. Following on, 100 in decimal means 10^2 = 100, and in binary it means 2^2 = 4. And so on. After this vacuum tubes were used instead of relays (could switch faster with no moving mechanical parts), which performed the switching instead of relays. 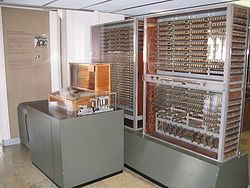 The ENIAC is an example of an early computer made with vacuum tubes. Then in the 60's transistors arrived and soon after ICs. The transistors perform the same function that the relays/valves had in earlier machines, but were a lot smaller, faster and consumed less power. The actual theory behind the basic way binary computer circuits work hasn't changed at all, just like we haven't changed the way we manipulate numbers in mathematics - algorithms improve but the basic rules remain the same. So if you know how binary works, and you have a simple circuit capable of storing either a 1 or 0 as two different voltage levels (e.g. 5V and 0v), and other simple circuits that can perform simple logical functions like AND and OR, then you can combine them all to do more complex stuff. Since all these binary circuits are just switches at the most fundamental, you can achieve the same thing with anything that can alternate between two states like mechanical/relay/valve/transistor/?. A 1 is represented by 5V and a 0 is represented by 0V. We want to store the number 123. So all we do is set switches 0,1,3,4,5,6 to 5V and switches 7 and 2 to 0V. This "stores" the number 123 in binary. This setup would be known as a "register". If you want to know more about how the switches are combined to form more complex circuits get yourself a good book on digital logic or ask google. This site doesn't seem to be too bad to start with. The program you are running is using voltages that represent ones and zeros. Everything about that digital part is voltages either close to ground or close to the supply voltage (5V in your example). When you load a processor register with 0xFF lets say you are creating 8 separate 5Volt signals somewhere in the chip. When you then store that register value in a control register that is related to the output ports, the output pins on the device the 5V signals in the processors register then cause other 5V signals to be created that are connected to the external pins of the device. The voltages are just a way of representing the binary. It is a quite efficient and practical conversion that allows for binary logic to be implemented using different transistor configurations. The way binary logic is usually implemented electronically is by using CMOS ( http://en.wikipedia.org/wiki/CMOS ) technology, in which two MOS transistors are set up in a complementary pair to form a CMOS gate. There are other electronic implementations of binary logic though, using TTL ( http://en.wikipedia.org/wiki/Transistor–transistor_logic ) for example, or relays. But you could use anything really, paper, paper robot goats: http://www.robives.com/category/product_tags/logic_goats . The electronical CMOS implementation just happens to be an efficient and practical one. Out of these simple CMOS gates, you can build more complicated logic gates: NAND and NOR, the standard gate being NOT, are the basic ones. Out of these, you can build everything that is binary logic, an adder, a register file, memory. Out of these you can build an ALU, all the way up to a complete microprocessor. Simply put, in a given range (usually from 5 to 12 volts) the most significant bit is 0 in the first half of that range and 1 in the other. The next most significant bit is calculated by further dividing that half in two and so on until all the bits have been calculated. Therefore, binary is just about increasing and decreasing voltages that are measured periodically. Not the answer you're looking for? Browse other questions tagged arduino microcontroller digital-logic or ask your own question. How does computer chip know what a 0 and a 1 is at base level? How does programming code provide power to electronic circuits? How a modchip overrides specific signals?